In order to remain competitive organizations must continuously change. The aim of every major change initiative is to reap rewards for the organization in some form. However, many change initiatives are unsuccessful, and in the worst case scenario, where everything is riding on the initiative, the end result can be the collapse of the organization. Thus, a big and important question all leaders face is: How can I ensure that my change program is successful? 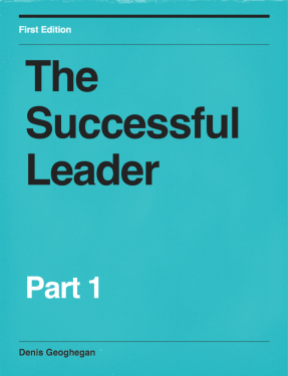 The leader might know what they would like the eventual outcome to be, but how do they go about delivering it? What are the steps which we need to undertake to maximise our changes of a successful outcome? Kotter first described the model in his book, Leading Change. We briefly examine each of the 8 steps below, but if you’d like more detail then check out the book on Amazon. It is necessary to create a sense of urgency around the initiative in order to maximize your chances of success. Kotter estimated that 75% of management need to back an initiative in order for it to be successful. Use as many facts as possible to persuade others to support you. In this step what you’re really trying to do is build lots of support for your initiative, so that the sense of urgency builds and reinforces itself. It’s not enough simply to try and push true a major change by yourself, you need to form powerful coalitions with key people in the organization. By getting powerful and respected people within the organization on side, you are far more likely to drive the change through. Bring all your key people together to form a change coalition or powerful change steering group. Aim to have as diverse a group of powerful people as possible, from different functional parts of the organization. A clear vision of how you see the future organization looking and why that’s beneficial, will help everyone to clearly understand why you’re asking them to action or assist this change. Every member of the change coalition should be able to describe the vision in less than 5 minutes, and it’s a good idea for you as the leader to practice you’re vision speech often, as you’re trying to inspire and lead the team to get behind you. Without credible communication, the hearts and minds of those who have to execute the change will not be won. If you think about all the different communications that happen on any given day in a typical organization, it should be obvious to you why your communication needs to be very clear and strong. Make use of all the communication channels available to you. Ensure that your change coalition is leading by example and walking the walk. Every time you speak or communicate in any way about the initiative remember to tie it back to the vision. Until now you’ve been painting a picture of the vision to inspire the team, now it’s time to remove any blockers or barriers so that the team can get on and implement the vision. Create the organization structure, either permanently or a project or program structure, so the work gets done. Set up the rewards system so the team is motivated. Keep a watchful eye for those who are resisting or blocking the change, and give them special attention to bring them on side. Major transformation can take a very long time, but without quick wins people will lose faith or give up altogether. You need to structure the transformation so it contains short term targets, remembering to communicate widely your successes. Remember that nothing breeds success like success. Praise and reward those who help reach the targets. As already stated, real change takes a very long time. Until new approaches have sunk in deeply, there is a high-risk of people reverting to the old practice or way of doing things. To counter this tendency, continue to set ever bigger goals to build on the successes and momentum you’ve already achieved. After each minor win, analyse what needs to be improved. This is the final step of the Kotter Change Model. In this step we aim to show how new systems, approaches, and behaviors have benefited the organization. How the values behind the original vision can now be seen by all. Remember that the focus and style of your communication should adjust according to where you are in the 8-step process. This article on The Change Curve can help you calibrate your communications appropriately. It is a top-down model, so opportunities can be missed because not everyone is involved in co-creation of the vision. It can lead to resistance and/or resentment amongst employees if consideration is not taken of The Change Curve and how people react to major change. 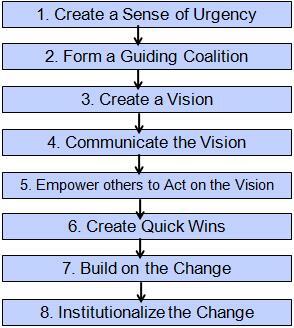 The Kotter 8-Step Change Model provides a step-by-step process you can follow to affect change within an organization. It can serve as a reminder that you need to get buy-in from senior stakeholders to ensure effective change. When program managing a major change initiative it is useful to refer to the 8-steps to help identify any areas you may have overlooked in managing the change. The Change Curve can be used to help you tailor your communications as you move through the Kotter change steps. I truly believe in Kotter’s organization change model. This is pretty easy to understand and implement. In project that you see these links are missing is definitely going in the direction of failure. I’ve been using this for years and always find it useful. I don’t tend to exactly follow the steps, but more use it as a reference to make sure I have all the bases covered and haven’t missed anything.